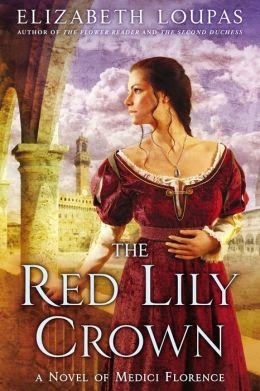 "The Red Lily Crown" by Elizabeth Loupas~Author Interview! or will he prove to be her most treacherous enemy of all? Elizabeth Loupas held various positions in radio and television, and worked as an editor, writer, and marketing consultant. She holds degrees in literary studies and library/information science. She lives with her husband and two beagles. 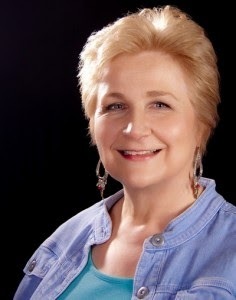 She is the author of The Second Duchess and The Flower Reader. 1) Tell us something about yourself, please. How do most people describe you? Most people would probably describe me as kind of solitary and stay-at-home. I suspect I’m the only writer in the world who grew up reading Little Women and wanted to be Beth. Briefly, from where did the idea for your novel come from? When I was researching The Second Duchess, I learned that Barbara of Austria and her younger sister Joanna traveled south from Austria together and were married at virtually the same time—Barbara to Alfonso II d’Este, Duke of Ferrara, and Joanna to Francesco de’ Medici, Prince of Florence. This intrigued me, and in early drafts of The Second Duchess, there were actually scenes in which Joanna (in Florence called Giovanna) visited Barbara in Ferrara. Those scenes were cut (primarily because they would have been historically inaccurate), but I didn’t forget Giovanna. A little reading about Francesco uncovered the fact that he was historically obsessed with alchemy, and the story pretty much exploded from there. 2) Who first told you that you could write well, and how did it affect you? The first person who encouraged me to write stories (as opposed to school “reports”) was my junior high school home room and English teacher, Maida Dugan. How I adored her! I wrote rambling romantic tales (even then I loved historical fiction) for her and she commented on them very kindly and patiently. I wish I could talk to her today and coax her to tell me what she really thought! She also assigned us poems to memorize, and I always chose the long story-poems—Poe and Browning and Longfellow. To this day I’ll start reeling off lines and lines of poetry when something jogs my memory, much to the amazement of my husband. 3) Which contemporary authors do you most admire? This will vary from day to day, depending on my mood. Some contemporary authors I’m reading at the moment are Deanna Raybourn, Lisa Brackmann, Kate Quinn, Sharon Kay Penman, Anne Rivers Siddons, and Kate Morton. I hate making lists like this because I want to include hundreds of authors! 4) Who are your favorite classical authors? This is another case of wanting to make a huge list of thousands of names. The swashbucklers, of course—Dumas, Baroness Orczy, Sabatini, Shellabarger, Dunnett. My beloved comfort reads—E.F. Benson, Angela Thirkell, Miss Read, E.M. Delafield, Flora Thompson. Jane Austen, the Brontes, Elizabeth Gaskell, Nathanial Hawthorne. The Pre-Raphaelites—the Rossettis, Swinburne, and Browning, of course, although he wasn’t technically a Pre-Raph. Oh, and now that I’ve strayed into poetry, Edwin Arlington Robinson. Sorry, I’ll stop now. 5) What was your first book as a child? What’s your all-time favorite book? The first books I owned were Little Golden Books. (Am I dating myself?) I remember The Pokey Little Puppy and one that had a fuzzy yellow cat—the pictures of the cat were flocked with velvety stuff so you could actually pet them. I was enthralled. I don’t think I have one all-time favorite book. Perhaps the six books of the Lymond series by Dorothy Dunnett—it’s all one story, so that would count as one book, right? 6) Best book you’ve read in the past 6 months? The one I got lost in most deeply was a re-read, ...And Ladies of the Club by Helen Hooven Santmyer. It’s enormous and reading it is like living a whole alternate life. 7) What’s the worst job you’ve ever had? The one (which shall remain unidentified) where I was shouted at repeatedly by my boss (who shall remain nameless). Or even worse, was trapped into sitting by while he shouted at someone else. I don’t do shouting well at all. See above about me wanting to be Beth March. 8) What’s your earliest memory? Being sick with the measles (according to my mother I was about three at the time) and “coloring”—scrawling all over with a bright red crayon—a drawing my older brother brought home from Sunday School. I swear I can still see all those loopy red scribbles. My brother was not amused. 9) What’s your most treasured possession? Barring the beagles—and I’m probably more their possession than they are mine—the first thing I’d grab in a fire would be a banker’s box filled with pictures, including the baby book my own mother lovingly created, and my own scrapbooks through the years. Oh, and I suppose the external hard drive I use for computer back-ups, so I’d have all my digital pictures and documents. 10) Are you working on a new novel? Oh, so delightful! You certainly are the "artical" one, Elizabeth. I look forward to the next book in your cache. I'm a huge fan! This is a delicious book of intrigue, mysticism and glamour. Ms Loupas never fails to pull us into a story. She had me from the first chapter with her brave and brazen young Chiara, and her introduction of the strong and stand-offish Englishman, Ruanno. The chemistry in this book isn't just alchemy!! Brilliant in details about the time and place of the Medici in Florence, this novel is vivid and engaging. I couldn't help visualizing as I read. Elizabeth Loupas is an alchemist herself with the use of color-effects and characterization. These characters are fiery and beautiful to read about. It's a sophisticated novel, not fluff. The plot of the story is well-developed with intrigue and mystery. I learned a great deal about the tools and mystique of alchemy, the House of Medici, and the culture of Florence. And the enchanting love story had me turning pages, as well. This is a "must read" for historical fiction aficionados. You will love the depths the story brings you into. I dare you not to identify with Chiara! I dare you not to be obsessed with the House of Medici in all its glory and madness! Exceptional writing. At this time we are very busy own working. There is very short time for entertainment. This time is appropriate for sleeping. This author don not watch TV before blogging. It is one type good news. Fantastic interview and superb review!